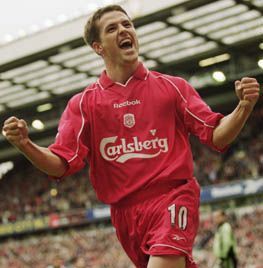 A supreme finisher and natural striker, Michael Owen exploded onto the first-team scene as a 17-year-old and left Liverpool with a ratio of a goal every two games and an FA Cup final named after him. Blessed with extraordinary speed and terrifying composure when presented with a chance, the Chester native notched 158 times in a Liverpool shirt during his seven seasons at Anfield. A graduate of the FA's Lilleshall school of excellence, Owen was prolific for the Reds' youth sides and played an integral role as the club claimed success in the FA Youth Cup for the very first time in 1996. Buzz and hype already surrounded this lethal forward and Roy Evans handed Michael a senior debut against Wimbledon on May 6, 1997; naturally, he required just 16 minutes to find the target after being introduced from the bench. For the next seven years, Liverpool were guaranteed league goals in the double figures by Owen - despite his tender age, he concluded the 1997-98 campaign with 23 goals from 44 matches in all competitions. England boss Glenn Hoddle simply had to select Michael for that summer's World Cup in France, and he was duly rewarded - the striker bagged a goal as a substitute against Romania. The nation demanded that Owen be selected in the starting line-up, a call acknowledged by Hoddle. His faith was rewarded in the Round of 16 clash with Argentina; snaking around and beyond a succession of challenges, Michael completed a breathtaking individual effort by clipping a finish into the net. England were eliminated, but their No.20 was world famous. Owen's searing acceleration meant the threat of hamstring injuries loomed over his fledgling career, but he nevertheless registered goal records of 23 and 12 in the next two seasons. Emile Heskey's arrival at Anfield in 2000 heralded a new era for Owen - at domestic and international levels - as the pair formed an effective partnership which allowed both to score goals. Michael added another 24 to his personal tally during the landmark treble-winning season of 2000-01, including an iconic brace beyond Roma in a UEFA Cup tie at the Stadio Olimpico. Owen's career-defining moment followed at the Millennium Stadium in May 2001, when Liverpool met Arsenal in the FA Cup final. With the Reds significantly outplayed and trailing 1-0 as the game neared its climax, the No.10 struck twice in the last seven minutes to single-handedly bring the trophy back to Merseyside. By the end of the year his performances had earned him the honour of European Footballer of the Year ahead of the likes of Raul and Luis Figo - becoming the first man to win the prize while playing for Liverpool. The goals kept flowing. In both 2001-02 and 2002-03 Owen struck the target 28 times, his personal best for a single season at Anfield. The latter campaign also included a goal in the League Cup final triumph over Manchester United. Michael's crucial strikes ensured Liverpool regained their place in the Champions League elite at the close of 2003-04, as Gerard Houllier handed the managerial reins over to Rafael Benitez. Owen travelled to Portugal for Euro 2004 that summer and scored in a penalty shoot-out defeat by the hosts. Upon his return to England, speculation was rife regarding a move to Real Madrid. A transfer to the Spanish heavyweights was indeed finalised in August 2004, bringing an end to a goal-laden spell with Liverpool which included four major trophies. Michael would later switch back to Barclays Premier League football with Newcastle United and subsequently Manchester United and Stoke City before retiring from the game at the end of the 2012-13 season.